Google Cloud Apps for Domains is multifaceted, it has some free offers like Custom Domain Email with limited features to Cloud Apps for power applications. Prevously we have published various on Google Cloud Apps, like Google Cloud Storage. Most basic users usually use Google Email service – GMail for custom domain names while the other options are more robust. Most Google Cloud Apps are freemium apps – limited on features with the free option and robust with paid option. In this article, we will discuss two aspects – first is whether you will use Google Cloud Apps for domains and if yes, how you can start using these Google Cloud Apps for domains. This will cover dual aspects. You have just another website and do not have mail server with your hosting service or it is underpowered, definitely Google Cloud Apps for domains is a far better and probably the only option. If you are using good web hosting which has bundled enough for you mail server and other services, like some plans of Rackspace has or our Managed WordPress Cloud Hosting (running pilot projects at the time of writing) has some good Cloud based services those are enough for you, there is no need to use Google Cloud Apps for domains. You are already paying for the similar service in that bundled package. For our Managed WordPress Cloud Hosting, you need not to decide anything as we will add Premium Google Cloud Apps for you, understanding your usage. For the Rackspace users, there are various free and paid quite good third party services too. This is what probably you were searching for – Google Cloud Apps for Domains. 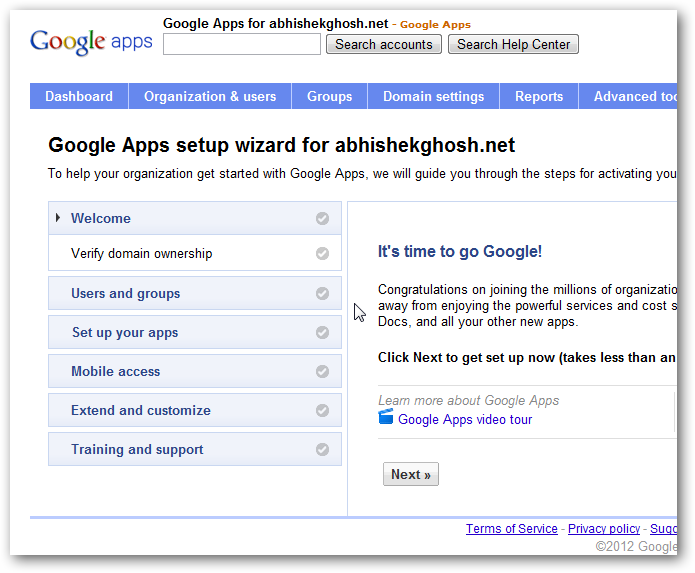 We are taking that you are in Situation 1 model and that is the sole reason for seeking Google Cloud Apps for Domains. The perspective of writing for Situation 2 and 3 will differ, although technically the things remains at some level same for any Google Cloud Apps for Domains. The new Google Cloud Apps for domains has changed a bit in look, you can get started with Google Cloud Apps for Domain by clicking here. 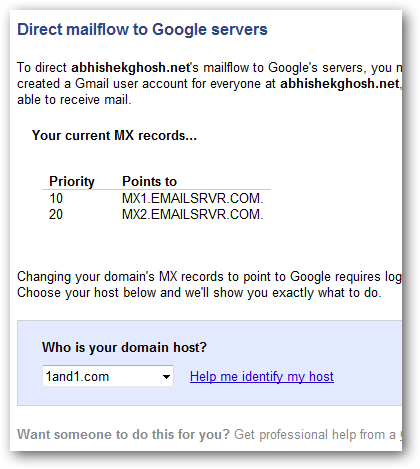 After signing up, you have to verify the domain ownership by adding record from your domain control panel and you need to change the MX records with Google’s one. And no further settings is required for Google Cloud Apps of this example – this is Gmail for custom domain name. You have to login to your server account and add the MX records. 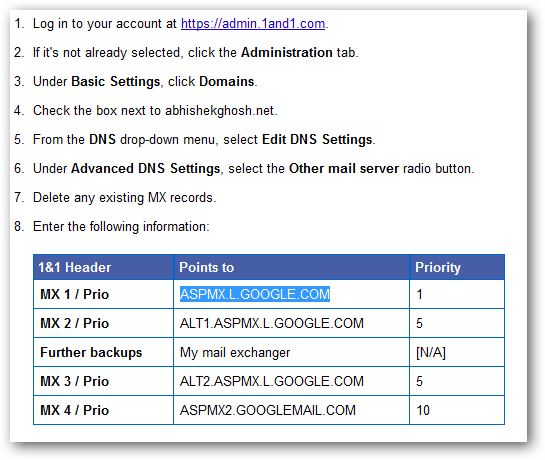 This is very simple step for Google Cloud Apps for domains setup and if you can not add MX records to complete the setup of Google Cloud Apps for domains, just ask your web host or determine what control you have and search with the appropriate words. This Article Has Been Shared 1163 Times! 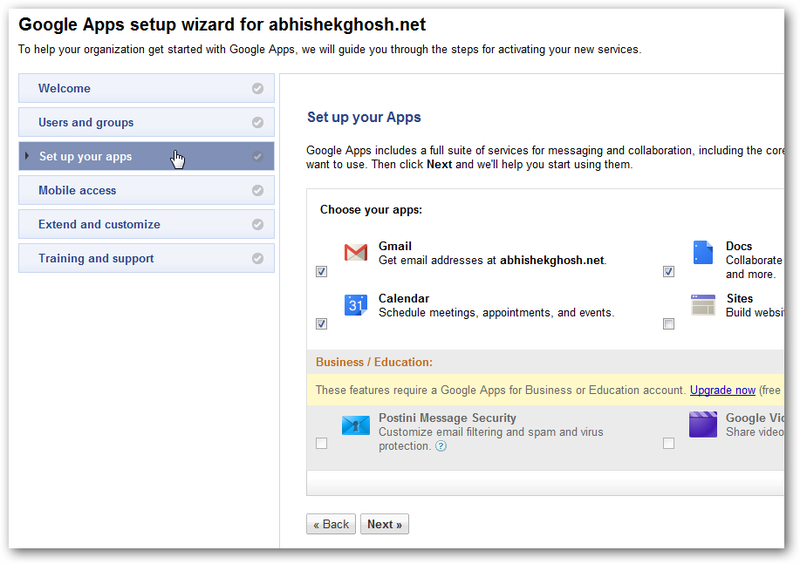 Cite this article as: Abhishek Ghosh, "Google Cloud Apps for Domains : How to Setup," in The Customize Windows, February 10, 2012, April 24, 2019, https://thecustomizewindows.com/2012/02/google-cloud-apps-for-domains-how-to-setup/.